How do I know what a Stone-Age dog looked like? One key character in my novel The Stone-Age Detective is a dog. I hope you have read my blog about my prehistoric detective novel. Even if you like what I say there, you may think everything I say about the dog in the novel is pure fiction, fantasy even. Well, I have found, to my surprise, how much scientists think they know about Stone-Age dogs. They have studied DNA from skeletons to establish that the ancestors of dogs were wolves, but by the end of the Ice Age they were two separate species. Dogs were generally similar to but smaller than wolves. What colour were dogs in the Stone-Age? The obvious answer is ‘we don’t know’, but there is a clue. A few years ago, Russian scientists experimented with selective breeding arctic foxes, to see how long it took to turn a fierce wild animal into a suitable pet. Not many generations. They found, unexpectedly, that the tamest ones were also different in other ways from their wild ancestors. In particular, they found the tame foxes were more often two-coloured. At first, white socks and tail tips appeared, but later some were 50/50. The scientists believe the colour element in the animals’ DNA is linked to the element affecting temperament. Wouldn’t Stone-Age Man have preferred plain dogs? As in my novel, many people probably thought plain dogs were better at hunting, but some would have liked more conspicuous canine hunters, because the prey moved away from them towards waiting humans. This phenomenon probably led to the development of the use of dogs for rounding-up domestic livestock. That is perhaps why most sheepdogs are black and white. Could a dog climb trees? Most dogs don’t. Whether they could, is another matter. I once owned one who did, usually when chasing squirrels. She didn’t often catch them. I gave my fictional Stone-Age dog that ability to add something to the story. A dog who looks much as I imagine a Stone-Age dog. Author gmonPosted on December 5, 2018 Leave a comment on How do I know what a Stone-Age dog looked like? Do you like dramatic reconstructions in historical documentaries? They say such reconstructions bring history to life, much like the reenactments often performed at historic sites in Summer. Some even say the same of historical novels, as they too fill in the parts the textbooks leave out. What’s not to like about dramatic reconstructions? The historian and presenter, Mary Beard, among others. She says many are of poor quality. I have seen some that were, but I found others very good. However, that is not her main point. She is concerned that reconstructions fix images in the mind. Therefore, you tend to think that is how things were, not just how they might have been. That is obviously misleading when you think about it, because they show only one version of how things might have been. I fear she may be right, but perhaps it is a price worth paying to make history more interesting and easier to relate to. What do you think? Are novels as misleading as reconstructions? I don’t think so. I hope readers know they are reading fiction and that even the historical background in a novel is likely to be only that author’s view of how it was. Most readers probably also realise that we usually adjust the history in places for dramatic effect. Personally, I try to admit to such adjustments in the historical notes I include in my books, but I might not remember to mention them all. A novel is not a textbook. How can you avoid being misled by reconstructions ? I think the best solution is to watch plenty of them! If you see several versions of the same story, you will be able to see how historians – and TV producers – differ. Be critical, in a good way. I don’t even mind if you read other historical novels to compare with mine. As I do. 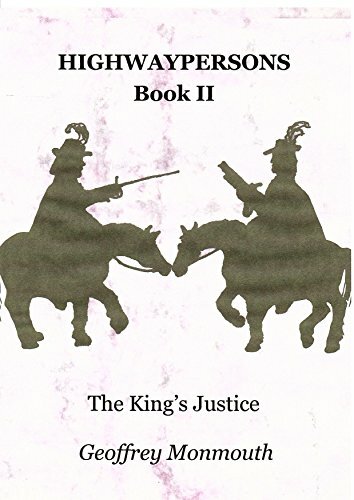 And here’s the link to Book II, The King’s Justice. Book III, Stallion Man will be out in the New Year. Author gmonPosted on November 29, 2018 Leave a comment on Do you like dramatic reconstructions in historical documentaries? Question and answer on the draft of The Stone Age Detective. You can send a question as well as criticism. Got a question? Here are some I have received about the Stone Age from readers of the draft of my novel, The Stone Age Detective, along with my answers. A cartoon man with a question mark. Question 1. Did people hunt in such large groups? Yes. That was one of the reasons modern humans, homo sapiens, were so successful in hunting such large animals. Neanderthals probably worked in smaller groups and some ask if that was their downfall. Question 2. Did women go hunting? We don’t know, but I suggest it was the exception if not that unusual. It helps the story. Humour me. Question 3. Did people kiss? We don’t know, but why not? Physical contact, especially touching faces, is an obvious way of expressing affection, encouragement or sympathy. If they didn’t do it by kissing, I’d have to invent something else for the sake of the story. Question 4. Could they recognise a human footprint as opposed to an animal track? As they lived by hunting, they must have known all about different prints. Question 5. How could they speak of points of the compass? We can’t be certain, but they must have noticed that the Sun rose and set in the same way every day and was always at its height in the middle and in the same place. Relating everything else to that must have seemed a good way of expressing direction. Is that all the questions? No! I will discuss more questions in another blog. Please keep sending them. We all learn from thinking about them. Author gmonPosted on November 23, 2018 Leave a comment on Question and answer on the draft of The Stone Age Detective. I have had some interesting feedback already from Beta readers and others. You have responded to my request and here are two of the main comments along with my responses. Keep sending them, so we can make this book as good as it can be. The main feedback is: there are too many characters in the early chapters. I agree, and there are 3 things I can and probably will do. Introduce the characters into the story more gradually. Produce a list of characters. Produce family trees for the main families. The next feedback is that the geography was confusing for some readers. I had thought of this and will put a map in the final version of the book, showing northern France and southern England at the end of the Ice Age, around 10,000 years ago. It might show the present coastline for comparison. Of course the words England and France would have been meaningless in the Stone Age. Thirdly, the language seems a bit too sophisticated at times. Nobody knows what language they spoke, but scientists believe it was something like the Basque language. The main reason is that DNA evidence suggests the earliest post-Ice-Age Britons were closely related to the Basques. That is not as surprising as you may think, since the nearest place where humans survived during worst of the freeze was northern Spain. I once met a few Basques, but we conversed in French, and I never learnt anything of their language. We don’t know how sophisticated or otherwise the language of our Stone Age ancestors was, but it’s the impression that counts. Therefore I am going through the draft again trying to use the simplest words and expressions possible. Some feedback consisted of questions. I will be answering some of those in another blog. I hope you will find the questions, and perhaps the answers, interesting. Keep asking. Please let me know if you would like a draft of the book for you to comment on, as I could still use some more friendly critics. Do I know enough about prehistoric life to set a novel in the Stone Age? Did you think I was joking about a prehistoric detective novel? I was serious when I answered that question recently. And I have tried to find out enough about prehistoric times to make the story realistic. I hope you will find some humour in it, but it is not a spoof. Forget the Flintstones. Is it different from other stories set in prehistoric times? I have tried to stick to what most modern archaeologists and palaeontologists believe. What the stones and bones don’t tell them, they sometimes infer from studies of hunter-gatherers in the present. But I have used creativity to fill in the gaps. What’s different from those other prehistoric tales? There are no dinosaurs. Mammoths yes. There are other large and fierce creatures too: bison, aurochs*, giant elk, several kinds of bear and big cats. I avoid the term sabre-tooth tiger because we don’t know what colour or pattern they were. I avoid the term Irish Elk, because they lived in other parts of Britain and elsewhere. Besides, Ireland was still attached to the rest of Britain at the time. We were all Unionists then. Britain was attached to the Continent. Brexit had to wait. People didn’t all live in caves. They built houses too. It wasn’t cool to go naked. It was only just after the Ice Age! People didn’t always look scruffy. If they could skin a bear or a mammoth, they could cut that skin to fit themselves properly, and they could choose plenty of smooth-haired animals too. If they made necklaces of beads, they must have cared about appearance. A prehistoric novel, yes, but a detective novel? People have always been capable of murder. At least some people. Remember Cain and Abel? And I believe that there have always been at least some people who cared about truth and justice. You may wonder how anyone could solve a murder mystery without forensics. Read it and find out! Author gmonPosted on November 8, 2018 November 9, 2018 Leave a comment on Do I know enough about prehistoric life to set a novel in the Stone Age? If you like reading, be a Beta reader and help me improve my next book. It’s someone who reads a draft of a book and gives constructive feedback to the writer. There are no qualifications except you must be able to read. They never get paid. The task is its own reward. Hopefully. What sort of feedback should they give? A quill pen. Beta readers can reply by any means they like. What should they not comment on? They are not editors. They shouldn’t waste time on grammar, punctuation, layout or other details. It’s the big story that counts. Don’t try to be an expert. Think like an ordinary person reading a book. Professional editors may be used later, when the overall story has been sorted out. Why are they called Beta readers? Beta is the second letter of the Greek alphabet. That’s about as much Greek as I know. I don’t know why they call them Beta readers. If you know, feel free to tell me. Author gmonPosted on October 27, 2018 2 Comments on If you like reading, be a Beta reader and help me improve my next book. Should the BBC be dumbing down history, even for children? Who says they’re dumbing down history? The BBC say they will be showing a new history programme for children. It will be presented by Danny Dyer of Eastenders fame. Many people assume this means dumbing down. Perhaps they have had a preview, but as I have not, I cannot say if that criticism is fair. How do you define ‘dumbing down’? The BBC say the programme is intended to be entertaining and amusing. They want children to watch it, but does this mean things will be oversimplified? You know, Good Things and Bad Kings. Will they select only the most ‘dramatic’ events? 1066, 1588, 1789, 1966? What sort of questions will they ask – and what will they avoid? Who were the real winners of the 100 years’ war? Who gained from the Industrial Revolution? Do I object to dumbing down? Not necessarily. I object to fake news, old or new, which includes gross oversimplification. Let’s not underestimate children’s ability to understand and let’s encourage them to think. As I also object to making history boring, I applaud this attempt at making it fun. Can we make it interesting without dumbing down? Yes. I was in Pembroke shire in Summer and visited a lot of castles. Some of them will feature in my next book, Stallion Man, the third in the Highwaypersons trilogy. Nowadays, the information provided, in leaflets, on notices and in audio recordings, is interesting, accessible and mostly true. Living history exhibits and demonstrations were fun and informative. The Red Dragon of Wales. Flown over most castles in Pembrokeshire, where they try to make History fun without dumbing down. I must especially compliment Pembroke Castle and make special mention of the tour guide, Isla, for excellence in presenting history in a way that people of all ages and existing levels of knowledge could enjoy. I hope the BBC can do as well as them, and that’s a challenge to me as a historical novelist. The first book in my Highwaypersons series. I hope there was no dumbing down in it. Author gmonPosted on October 23, 2018 Leave a comment on Should the BBC be dumbing down history, even for children? A palaeolithic detective – am I serious? The Palaeolithic period is the Old Stone Age. In most countries it was replaced by the Neolithic or New Stone Age. In Britain, we had to be different. We had the Mesolithic or Middle Stone Age in between. What’s the difference? Are archaeologists just splitting hairs? The words refer to the different lifestyles of the three eras. In the Old Stone Age, people were hunter-gatherers, i.e. they lived by hunting and eating fruits, nuts and berries they found growing naturally. They were nomadic, or semi-nomadic, following the herds in their seasonal migrations. What happened after the Palaeolithic Age? In the New Stone Age they became farmers, taking control of the production of their food, and became settled. In Britain, and a few other places, there was a period between the two, when people kept semi-domesticated animals, but still migrated with them, like the reindeer herders in Scandinavia today. The dates of these ages differed in different countries, because the changes in lifestyle didn’t happen at the same time everywhere. The British seem to have been among the last to catch on. Always keen to hang on to old traditions. There were probably objectors to cutting down forests and draining marshes. Destroying the natural habitats of mammoths and sabre-tooth tigers. Why am I talking about the Palaeolithic Age? Because that’s the setting for my next book. About 8,000 years BC, when people began to move back into Britain after thousands of years. Not the same people. During the Ice Age nothing had lived in most of Northern Europe, but the climate was changing, making the region inhabitable again. Did I say palaeolithic detective? Really? If Palaeolithic people were hunters and gatherers, there wouldn’t have been many detectives, surely? Not many criminals either. Yes, but… selfishness and wickedness have always been around, and there must always have been some sort of rules to make society work effectively. And hunter-gatherers needed discipline to work effectively, otherwise it wouldn’t have been the sabre-tooth tiger that went extinct. Rule-breakers were a threat to the rest. Someone had to exercise authority. Wasn’t life cheap in the Palaeolithic era? Yes and no! Life was often short, for lots of reasons, and there were probably violent clashes between people-groups at times, but cooperation was essential to everyone’s survival. I suspect that a lot of conflicts were resolved peacefully, or by limited, ritualised violence. I think murder would have been punished. Presumably by death. Weren’t palaeolithic people too superstitious for scientific detective work? Up to a point, but people have always been rational, capable of understanding cause and effect. Some more than others. That’s why my hero is a bit different from the average person of his day, but only a bit. He was the one who made the lever deductions, but most of the others would get it, once he pointed something out. How he does it, you’ll have to read the book to find out, but he’ll need help. The help of a dog, a god and a flint. A palaeolithic dog – or is it a wolf? Author gmonPosted on October 10, 2018 December 1, 2018 Leave a comment on A palaeolithic detective – am I serious? Have the hard brexiters and the EU forgotten the history of Ireland? Why do brexiters need to study the history of Ireland? I would like everyone to take an interest in history. At this moment, it is particularly important, especially for the political leaders in the UK and the rest of the EU. One of the thorniest problems for the Government has been the relationship between Northern Ireland and the Irish Republic. How does Brexit affect Northern Ireland, or vice versa? The UK needs to maintain an open border between Northern Ireland and the Republic, if it is to comply with the Good Friday Agreement. This came into being, at the end of a long and difficult peace process. It is hard to see how we can maintain that arrangement in the event of a hard Brexit. Similarly, Ulster Unionists will regard any arrangement which treats Ulster as separate from the rest of the UK as a threat to the Union. A cartoon man with a question mark. Trying to think of a solution for Northern Ireland? Yes! Anyone who remembers the violence of the 1970’s and 1980’s, or who knows of the centuries of Anglo-Irish conflict, should have no difficulty seeing why we must keep to the Good Friday Agreement. Someone said the attention being paid to this issue was a case of ‘the tail wagging the dog’. Does he think minorities don’t matter? Is antisemitism unimportant, or why care about Scotland or Wales? The saltire. If you are British, Scotland matters, as do Wales and Northern Ireland. Who needs to remember the history of Ireland? What’s been the role of the Republic of Ireland? The Irish Government has not been conspicuously proactive in finding a solution. They should look at their history and learn the lessons. The English never remember and the Irish never forget. Let’s hope we don’t repeat the mistakes of history this time. Author gmonPosted on September 22, 2018 Leave a comment on Have the hard brexiters and the EU forgotten the history of Ireland? Was the book about the slave trade and the Jacobites? No! Highwaypersons Book II, The King’s Justice, was an adventure set against the background of a Jacobite plot in 1716 when the characters also encounter the slave trade. I hope you enjoy the story as a good read, but in a recent blog, I suggested some questions you might like to consider or discuss about the historical background to Highwaypersons Book I, Debts and Duties. If you enjoyed thinking about those, you might like these, about Book II, The King’s Justice. Remember, there are no right answers, as the questions are to provoke thought and develop your understanding. Questions about the slave trade. Why did Billy and Bethan know so little about the trade at first? Did Megan’s view of slavery change after her encounter with some slaves? Why did so many British people condone or accept this trade, like the merchants at The Mermaid? Who lost as a result of it, apart from the slaves? Why did Africans collaborate in the trade, as Thomas described? Why did the authorities stop sending white people into slavery in the Caribbean? Was slavery illegal in Britain but lawful in her overseas possessions? Why did Sweden want to help the Jacobites? Was a Swedish invasion of Britain a serious possibility? How helpful to the Jacobites would a Swedish invasion have been? Why did some Protestants, like Charles Butler, support the Catholic Pretender, James Stewart? Why did he pardon so many of his enemies? Did he support the slave trade, not know about it or just not care? Why did Billy not realise Georg von Luneburg was King George? Don’t be a slave to the questions! They are there to help you get a bit more out of the books, if you want, but don’t let the questions take over from the stories. They are fiction set against a real historical background. Enjoy your reading, and I hope the third volume in the series will be out after Christmas, if not before.